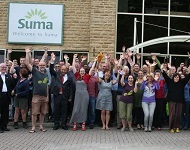 Suma is the UK’s largest independent wholefood wholesaler/distributor, specialising in vegetarian, fairly traded, organic, ethical and natural products. 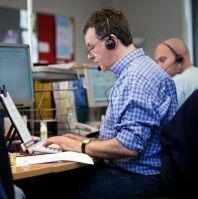 We are a workers’ co-operative committed to ethical business. Unlike most UK companies, Suma operates a thoroughly democratic system of management that isn’t bound by the conventional notions of hierarchy. As a workers’ co-operative the business is jointly owned and managed by all of us. Everyone is paid the same and we collectively do all the jobs that need doing, whatever they happen to be. All our products are diligently sourced; all are vegetarian and where eggs are an ingredient, they are free-range. We stock organic versions of everything we can, support fair-trade as a licensee of the Fairtrade Foundation and all our bodycare, cosmetic and household products are cruelty-free. We are one of the few businesses in the UK that sell only vegetarian produce. You can be assured that all of our products are 100% vegetarian from our sweets to our tooth-brushes. That means no meat, no fish and no animal derived nasties like gelatin or rennet. We are also a member of the Vegetarian Society, who aide us in promoting a healthy, vegetarian lifestyle. As a distribution business we’re acutely aware of the impact that business has on the environment at local and global levels and continually strive to keep it to a minimum. We’ve been using 100% renewable electricity for ages and even then our motion sensors switch the lights off when we leave the room. Our reps share a hybrid car. We take back plastic and cardboard packaging from our customers and what we can’t re-use, we recycle. Food waste is composted. We plant enough trees with Treesponsibility to get carbon neutral status and have an appointed carbon champion keeping a constant eye on our footprint. And we have vehicle tracking which means we make every delivery mile count. At Suma we have always acknowledged our responsibility to the people who grow the food, which is why we are a licensee of the Fairtrade Foundation. Our commitment to fair trade is not a marketing device, it is one based on a deeply held belief in a universal right to economic justice, self-empowerment and freedom from exploitation.